RISING star pacer Jilliby Kung Fu has been named Victorian Horse of the Year. Following an interrupted, yet highly-successful, 2017/18 season, Jilliby Kung Fu was bestowed the honour by Harness Racing Victoria just moments ago. Trained by Marg Lee, the Australian Pacing Gold graduate won five of his eight starts for the term, with two seconds and earnings of $332,790 also to his credit. 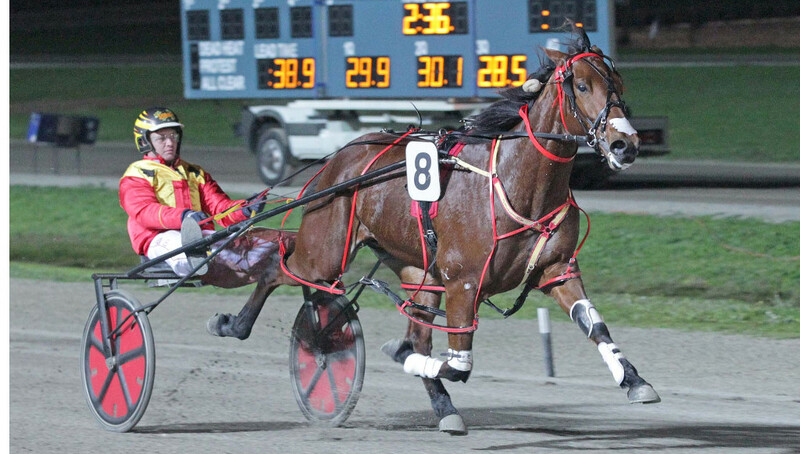 Triumphant in a pair of Group Ones – Chariots Of Fire and Four-Year-Old Bonanza – Jilliby Kung Fu also finished second in the Miracle Mile and Empire Stallions Vicbred Super Series. Jilliby Kung Fu was also an obvious choice for Four-Year-Old Entire/Gelding of the Year. To connections’ dismay, the son of Four Starzzz Shark was sidelined with tendon issues last August, which will see him out of action until 2019. Speaking of Four Starzzz Shark, he is also the sire of Aged Stallion/Gelding of the Year – Lennytheshark, which was the 2016 and 2017 Victorian Horse of the Year. Retired during the season, Lennytheshark is enjoying his first term at stud alongside his father! Other awards announced tonight include: Aged Pacing Mare: Ameretto, Aged Trotting Stallion/Gelding: Sparkling Success, Aged Trotting Mare: Maori Time, Four-Year-Old Trotting Entire/Gelding: Kheiron, Four-Year-Old Trotting Mare: Margaret Ruth, Four-Year-Old Pacing Mare: Carlas Pixel, Three-Year-Old Trotting Colt/Gelding: Wobelee, Three-Year-Old Trotting Filly: Moonshine Linda, Three-Year-Old Pacing Colt/Gelding: Poster Boy, Three-Year-Old Pacing Filly: Shez All Rock, Two-Year-Old Trotting Colt/Gelding: Always Ready, Two-Year-Old Trotting Filly: Sleepee, Two-Year-Old Pacing Colt/Gelding: Centenario and Two-Year-Old Pacing Filly: Kualoa.